Text wrapped inside asterisks (*) and underscores (_) will be emphasized. Use the one you prefer. Click on the red points to know more. Move through the exercises by using the buttons or the dot menu at the bottom. Click on the red points to know more. Move through the exercises by using the buttons or by swiping left or right. 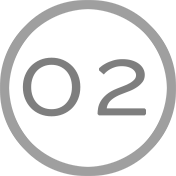 One asterisk (or underscore) will make the enclosed text italic. The same character must be used to open and close the emphasized text. Two asterisks (or underscores) will make the enclosed text bold. There must be no space between the asterisks (or underscores). In this exercise, make the words "American Oxygen" bold. The music video for Rihanna's song American Oxygen depicts various moments from American history, including the inauguration of Barack Obama. 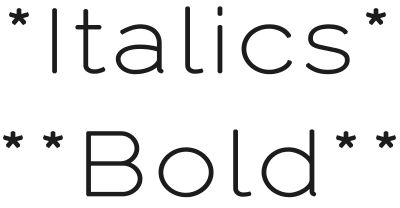 You can use bold and italic in the same text at the same time. For this exercise, make the words "The New York Times Best Seller" bold and "The New York Times" italic. Hint: You can also use asterisks and underscores at the same time. Pearl Schiff couldn't find an American publisher for her second novel after her first made The New York Times Best Seller list. If you need to use an asterisk or an underscore as a literal instead of as delimiter, use a backslash to escape it. In this exercise, convert the text 20% OFF (in italics) to *20% OFF* (surrounded by asterisks). Play with the concepts you just learned! What happens when you have more than two asterisks (or underscores)? In both sides? In just one side? Is always necessary to escape an asterisk (or underscore) when you want one inside a emphasized text? Emphasize a text and then add spaces around the asterisks (or underscores) and the text. See the generated HTML. Even if you don't know HTML, try to understand what's happening. Go wild! Go to the next lesson when you're ready.